Cadbury Castle – Home to King Arthur and Camelot? I am fortunate to have an unbroken 180 degree vista from my home. One location I can see quite clearly is Cadbury Castle located alongside the picturesque village of South Cadbury. Cadbury Castle is an ancient hill fort with built up earthen ramparts similar to many others in the West Country. Excavations have revealed occupation since Neolithic times until the Roman invasion of England. In keeping with similar sites, due to ideal military and defensive locations, the Romans took over these sites to aid their governance of England. Following the withdrawal of the Roman occupation, little or no documentation for this site exists until it was mentioned in a letter by John Leland in 1542 while undertaking a survey of England. The letter states that local folklore by villagers mentions King Arthur and Camelot. The site is also on part of what has become known as the Leland Trail, a 28 mile footpath that follows John Leland’s steps between Ham Hill Country Park in Somerset, (another hill fort), and King Alfred’s Tower in Wiltshire which is close to the source of the River Stour and nearby Stourhead. It is unknown whether a King Arthur existed or not although much legend and myth pervades English folklore. If he did exist, it would have been in the period known as the Dark Ages due to the lack of documentary evidence and knowledge of that period. One of the earliest references to King Arthur is in the nearby Glastonbury Abbey where the supposed body of King Arthur was discovered and re-interred in the knave in 1278 in the presence of King Edward I and Queen Eleanor. As an aside, many geographical locations take their name from the death cortege of Queen Eleanor when she died in Nottinghamshire. King Edward I transported her body back to London and at every location the cortege stopped for the night, King Edward I later erected an ornate stone cross. These crosses known as the Eleanor Crosses gave rise to such locations as Banbury Cross, Waltham Cross and Charing Cross to name but a few. The Abbey close to Waltham Cross is where King Harold who was killed by Norman invaders at the Battle of Hastings in 1066 is now known to have been secretly buried. 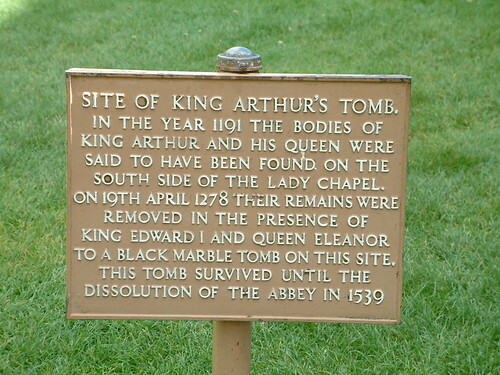 Although King Arthur is supposedly buried at Glastonbury Abbey, it is also thought possible the entire reburial exercise was part of a ruse to attract additional revenue and tourists in the form of Pilgrims. The excavations at Cadbury Castle certainly revealed the presence of a former Great Hall and local place names like the River Cam which flows close to its base along with nearby villages of Queen Camel and West Camel help to reinforce the local legend of Camel-ot. Other locations in England most notable Tintagel in Cornwall also lay claim to King Arthur. Whatever the truth, if King Arthur never existed then he certainly would have been invented as a necessity of historical prestige. Most countries of the world have their own King Arthur figures whether actual or mythological. It is however quite nice to sometimes fantasize that King Arthur and his Knights of the Round Table in their shining armour once rode past my front door. The only problem with that fantastical notion is my home at that time would have been a wattle and daub hut.